S.Morozov. TEN AND A HALF WEEKS. THE WAR AND THE DEATH OF A.F.ILIN-ZHENEVSKIY. On the 28th of November (the 16th of November in the Old style) there was 110th birthday anniversary of Alexander Fiodorovich Ilin-Zhenevsky, who was an outstanding master and organization of the chess movement, revolutionist, diplomatist, writer, journalist and public figure, the whole life of whom was connected with his native city – Petersburg. Few words about chess appearances of Alexander Fiodorovich. In 1914, living abroad he became the champion of Geneva and the island Capri. Playing in the championships of Leningrad, Ilin-Zhenevsky twice (1926, 1929) became the champion, once tied for the 1 – 4 places (1925), in other seven competitions (1924, 1928, 1932, 1936, 1937, 1939, 1940) was among six strongest players. Alexander Fiodorovich took part in nine championships of the USSR (the first seven of them and also IX and X). He achieved the best results in 1923 (7-8) and 1925 (6-8). He was the Champion of trade unions and chess International in Berlin in 1926. He participated in the I Moscow international tournament, in which tied for IX-X prizes and achieved a sensational win over J.R.Capablanca. Ilin-Zhenevsky was the first chairman of Leningrad government chess section, in other words the first president of the city chess federation. Over a long period of time (1924 – 1937) he was a member of the Executive bureau of the All-Union chess-chequer section. He was an editor of the first in Soviet Russia chess department («To the new Army») and chess edition («Paper of the Petrogubkommuna») in 1920-21. In 1920 he became a commissar of the central department of the universal military education and obtained introduction of chess into its program. He was the organizer of the All-Russian chess Olympiad in 1920 – the first championship of the country. He was an executive editor of the journals «Chess Paper», «Chess in the USSR», conducted departments in «Pravda», «Krasnaya Gazeta». He was the author of the books: «Match Alekhin – Capablanca», 1927, «International chess tournament in Moscow» (the journal of the competition), 1926, «Notes of a Soviet master», 1929, «International worker's chess movement and Soviet chess organization», 1931. He published a number of chess articles, two of which we'll mark out: «On what chess success depends» (1929), «Psychology of chess mistake» (1928). In 1933 Ilin-Zhenevsky was the adviser to the plenipotentiary representation of the USSR in Prague, certainly he communicated with Czechoslovak chess players, among them with the champion of the country. Salo Flor was always distinguished by enterprising character – he was then a chess hope of the West – and apparently counting on not difficult win, suggested to play match with the champion of the USSR. Zhenevsky sent two letters: the first one to Krylenko, and the second one to Winestein for me. He was enthusiastic about the suggestion of Flor and believed in success of the Soviet champion». We told at our website about last days of Alexander Fiodorovich in the article «Ten and half weeks. The war and the death of A.F.Ilin-Zhenevsky». To the anniversary of the master we've prepared publication of an extract from the autobiography of his brother – F.F.Raskolnikov (where he in detail tells about the family), the autobiography of A.F.Ilin-Zhenevsky, written in 1926 and updated in 1932. Then the life and activity of Alexander Fiodorovich in 1932 – 1941 are presented briefly. And finally a small leading article of Ilin-Zhenevsky «For chess as art!» («Chess Paper» №4, 1930) is published, in which, as in the autobiography, we haven't cut anything to keep the spirit of the age. 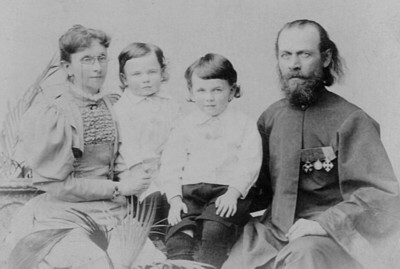 Family portrait: the mother – A.V.Ilina, Alexander, Fiodor and the father – F.A.Petrov. Petersburg, 1897. I, Fiodor Fiodorovich Ilin, was born in 1892, on the 28th of January, in St.Petersburg, at Bolshaya Okhta, in the Mironovaya Street. I'm an illegitimate son of an archdeacon of Sergiev cathedral and a daughter of a major-general, a saleswoman of wine shop, Antonina Vasilevna Ilina. My parents were not married in church because my farther as widowed clergyman couldn't marry for the second time. They both were quite religious people and lived the whole 19 years of their joint life in peace and friendship. My farther was born in 1846 in a village Keikino of Yamburgsky uyezd, Petersburg province, and my mother was a native of St.Petersburg, the date of her birth was the 3rd of June 1865. My father died on the 12th of 1907; he committed suicide, having opened his carotid artery with a razor. The reason of death was the fear of search, arraignment and discreditable publicity on account of complaint of his maid about violation of her by him, lodged by her in St.Petersburg circuit. By the admission of my farther and his associates the complaint was unfounded. As advocates an attorney at law Nikolai Platonovich Karabchevsky and his assistant Atabekov were invited. In the opinion of the advocates, the result of the case was hopeless for the complainant because of the total absence of evidence and eye-witnesses. But the farther didn't wait till the hearing of a case and at the 62nd year of his life committed suicide. As everyone, who knew the late, evidenced that he had a mild character and outstanding voice. The mother is living in the present; she works as a saleswoman in the wine shop № 148, situated at the Vyborgskaya side, in Finsky alleyway, in the house № 3. Here salary is 750 rubles per year; besides, she uses a public three-room flat, having provided lighting and heating. "Fiodor Raskolnikov tells about the time and himself. Memorials. Letters. Documents". The compiler is I.P.Kossakovsky. 1989. 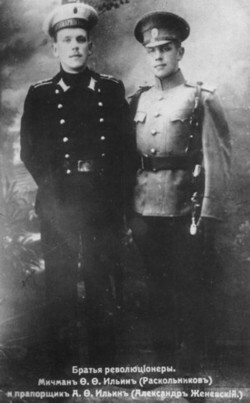 Brothers: warrant officer F.F.Ilin (Raskolnikov) and ensign A.F.Ilin-Zhenevsky, Petersburg, 1915. Written in 1926 for party archives, updated in 1932. I was born in 1894, in Petersburg. My farther Fiodor Alexandrovich Petrov was an archdeacon of Sergiev cathedral. My mother Antonina Vasilevna Ilina was working as a small clerk, and at the time of my birth and childhood she served in a wine shop. My parents were not married officially, as my farther was the widowed ecclesiastic hadn't right to marry for the second time. Myfartherdiedin 1907, whenIwas13 yearsold. Besides me my parents had another son Fiodor, who was three years my senior. AtpresenttimeheisknownasRaskolnikov. Both I and my brother very early, almost since childhood were taking part in revolutionary movement. Already in 1905 my brother, being in the 7th form of school, was one of the initiators of students' strike, which nearly led to excluding from school. In 1905 I was only 10 years old, but the events of that time influenced me very much and predetermined the rest of my development. Already in 1909, when I was 14 years old, I read "Anti-Duhringа" of Engels, and a year later I read "Capital" of Marx, works of Lassal, Lafarg and others. Especially profound effect had on me works of Karl Kautsky, which were the easiest to master and determined my ideology, setting it out on the path of orthodox Marxism. The development of certain political views was accompanied with taking part in active social and revolutionary work. Already since 1910, that is since the age 15, I had been engaged in many illegal students organizations and societies. In Vvedenskaya school, where I was studied at that time, I was a member of the editorship and issued students illegal hectographical journal "Nedotykomka", where I put to articles and pamphlets the signature "Es-dec". In 1911 I with my comrade Prussak (in 1913 he was condemned and sent into exile in Siberia, he died in 1918) was elected from the Vvedenskaya school into the committee of the Inter-school organization, allotting a task of joining up of students of secondary schools owing to social, professional and revolutionary work. The Inter-school organization united not only organization of Petersburg students, but also had contacts with the provinces. In 1912 I officially entered the party of Bolsheviks, having organized together with another member of the committee, student Kantor a Bolshevistic group in the committee of the Inter-school organization. The same period can be dated a work of my brother first in "Zvezda", then in "Pravda", where he was the first secretary of editorial staff. In the same year I got acquainted with Molotov, Eremeev, S.S.Danilov and other comrades, the names of many of them I haven't remember. On the 9th of December 1912 a sensational collapse of the Inter-school organization took place, which was famous then through newspaper's reports as "Vitmer story", because the arrest of 34 members of the organization, including me, took place in a room of O.K.Vitmer's girl's school. That case aroused a widespread interest of public organizations and even served as a material for inquiry in the State Duma. Thanks to all that and also to the press campaign pointing to inadmissibility of repressive measures to juvenile participants of the Inter-school illegal organization, my colleagues and I avoided prison and exile. The largest severity to us displayed the Minister of education of that time, Kasso, who administered new, unused before, punishment, namely deprivation of the right for education. Thus, being excluded from the last form of the school and having no possibility to continue education in Russia, I as a number of my comrades had to accept an offer of famous patron M.A.Shakhov and to go at his expense abroad for the continuation of education. In Geneva I took extra examinations for matriculation and was taken in the natural faculty of the university. A great assistance in the matter of my matriculation was rendered by my fellow-members, particularly Karpinsky and Menshevik Karadjan. In Geneva I joint to Leninist's group and there I got acquainted to Vladimir Ilich Lenin, with whom I spent the whole day of his stay in Geneva at Karpinsky's place. Vladimir Ilich then in the letter to Karpinsky invited me to visit him near Krakov, where he lived at that time. In the summer of 1914 I was returning to Russia for summer vacation. On the 5th of July I was going via Berlin. On the 14th of July the war was declared and I didn't have to think of going back to Switzerland. Having stayed in Russia, I engaged in party work again and firstly worked at the legal party bookstore "Pravda" and then upon the recommendation of Bolsheviks L.N.Stark and my brother and by invitation of Komarovsky (Danskoi) became a director of an office of legal Bolshevistic journal "Problems of insurance". I was 19 at that time. At the end of year 1914, when I was 20, it was issued a manifesto about first preschedule conscription and I had to give up my work and to enter the army. On the 9th of February 1915 I put on the "king's coat" for the first time, on the twentieth of the same month I got to the ensign's school and on the 14th of May I got a commission of ensign and assignment to the front. It was the hardest period at the front when our troops, demoralized, without shells, retreated and yielded town after town. On the twentieth of May I was already at the front and at the 30th of May I had to repulse fierce Germans' attacks on Warsaw and finally I fell asphyxiated with choking German gas that was then a novelty. But I was treated not long and approximately in a fortnight got an assignment to the south front in the 3rd army, which was dislodged from Carpathian Mountains and retreated along Galicia in a terrible condition. I found that army already at our territory and traveled with it a hard way through Lublinskaya and Kholmskaya provinces. At last on the 9th of July near a place Piaski during our counter-attack I was seriously contused into my head, back and legs. I was taken away from the battlefield, evacuated to the rear and conveyed in Petrograd in semi-conscious. There doctors established that I had a paralysis of both legs, cutting of both arms, amnesia of Korsakoff's type, full astasia and central nervous system activity reduction. I was put in field hospital of sugar manufacturer Kenig and was treated by one of the best neuropathologists, assistant of professor Bekhterev, V.V.Sreznevsky, Doctor of Medicine. Owing to careful treatment and competence of physicians exactly in a year I could get on to feet, though medical board rejected me for the front and reckoned among the 3rd category 2nd class, that is allowed to serve only in noncombatant corps in time of peace. I got assignment as a former student-naturalist to the Reserve flame-chemical battalion in Petrograd. I used as an excuse my stay in Petrograd and started party work again. Together with my brother, L.N.Stark and S.Roshal (my comrade already in "Vitmer case") I organized a number of meetings, at which we carried on spirited polemics with "defenders". As I and my brother both were military men (my brother was studying in midshipman classes), we intensely guarded our flat, organizing in it only extremely secret meetings, and nevertheless there were provocateurs at three of them, at two there was Chernomazow, at one – Menshevik Vitka, known under the nickname "Aktiv". In the same year, having seen that our party publishing house "Priboi" was inactive, I with my brother, Stark and P.V.Lasheevich and some other comrades (it seems to me that notorious Chernomazov was among them) organized a Bolshevistic publishing house "Volna", which worked right up till the revolution and issued a number of tracts of Kamenew, Zinovew, Tsaperovich and others. This publishing house was approved by the Central Committee and a representative of the latter was sent to it as a delegate. I didn't participate directly in the February revolution, as I was an orderly officer on that day from 26 to 27 of February. Our battalion as unreliable unit wasn't sent to suppress an insurrection and this is the case that after the revolution it was the first unit that sanctioned it and recognized the Provisional government. Early in March together with a group of comrades, delegated by Kronstadt Party Committee (Dmitry Zhemchuzhin, who was later on shot by White Finns in Helsingfors, Fiodor Dingelstedt, Pelikhow and a soldier Zinchenko, we were five in all) set off for party work to Helsingfors, where almost the whole our Baltic Fleet lay. Our work in Helsingfors succeeded from its first steps. In the day of arrival at the meeting aboard the battleship "Republic" we managed to collect 100 rubles for the newspaper, which we wanted to deliver, and veritably on the third day of our stay we issued first number of Bolshevistic newspaper under the name "Vilna". In view of the fact that there was no party organization in Helsingfors, we called that newspaper an organ of Sveaborg sailors' Bolshevistic body. At the same time we started organization of Bolshevistic cells and soon we managed to create Helsingfors committee. The whole work proceeded in the atmosphere of relentless persecution and slander that our party and other enemies at once hastened to disseminate about us. "Volna", which had been made by me together with Zhemchuzhny, after his departure was carried out by me alone, thereby I was at the same time an editor, the only regular contributor, issuer and proof-reader. In the middle of April, after the city party conference, at which I had presided, when our organization had become stiffened enough and had included over thousand people and when other executive members, as for instance Kirill Orlov, Bon, Vladimir Zalezhny and others, had come to Helsingfors, I could return to Petrograd. In Petrograd I as before formally took rank as the officer of the Reserve flame-chemical battalion, though I went there only occasionally, and gave the rest of my time to party work, mainly to newspapers. First I edited the newspaper "Soldatskaya pravda" together with Podvoisky and Newsky, then during my brother's going away from Kronstadt I edited instead of him the Kronstadt newspaper "Golos pravdy". During the July events I took an active part in them. First of all at the meeting of the Reserve flame-chemical battalion I urged the battalion to join to the general demand of the Petrograd garrison about devolution of power to the Soviets and to made this demand public knowledge. That appeal of mine met with no sympathy of the antagonistically inclined battalion of that time. Then I together with K.S.Eremeev on the instructions of military organization tried to procure weapons for Bolshevistically inclined units. On the 5th of July, when it already became clear that the Provisional government was planning to suppress the arisen movement by main force, again together with K.S.Eremeev we were sent as delegates for negotiations with commander-in-chief of the air defence forces general Polovtsev, who assured us that he wasn't planning any armed operations against us. But at the next day, on the 6th of July an assistant of the general Polovtsev, lieutenant Kuzmin presented an ultimatum to us to disarm and surrender. When the forces of the Provisional government surrounded us, I took from Podvoisky command over the Peter-and-Paul's fortress, where the faithful to us units gathered, mainly Kronstadt sailors and machine gunners of the 1st machine-gun regiment. After a short siege we surrendered. That was also the decision of the Central Committee, transmitted to us by specially delegated Stalin. After a short-term arrest I was frees just as my comrades and our case was relegated to a special committee of inquiry. But the situation developed so rapidly that the committee couldn't finish its work. (The July's events were described in detail in my book "From «the February» to seizure of power", 1927). July events and the subsequent persecution of me on the part of the commander and officers raised my authority over my soldiers. I was at once elected first a vice-chairman of the battalion court, then a member of battalion committee, member of many commissions, then a vice-chairman of battalion committee and at last a member of the Petrograd Council instead of an earlier elected Menshevik. But the work in the battalion and in the Petrograd Council didn't divert me from the continuing of the previous work. Before the Central Committee could restore after the July chaos its party editions, Podvoisky, Newsky and I, having visited many printing-houses at last got settled with difficulty in one of them and proceed with editing of "Soldatskaya Pravda", but under the new name "Rabochiy I soldat". Soon "Rabochiy I soldat" was closed down by the Provisional government, then we edited the same newspaper under the name "Soldat". In such a way I was working right up till the October revolution. On the 21st of October I got an assignment to a position of a commissar of my Reserve flame-chemical battalion, and the next day in addition – of a commissar of the Reserve Guards Grenadier regiment. Together with those two units I held the whole Petrogradskaya Quarter in hand, and when the revolt of cadet of Vladimirskoe military school broke out (I had the forethought to arrest the whole Pavlovskoe military beforehand), I took the first blow of it upon me and participated in its suppression. In greater detail it was described in the above-mentioned book of my memorials. When Kerensky was defeated near Petrograd and our positions became stronger, my brother invited me to go with a detachment to support Moscow, where fighting with troops of the Provisional government was going at that time. That detachment, which included in addition to infantry also two armoured troop-carriers of the Putilovskiy factory, was commanded by colonel Potapov, its commissars were K.S.Eremeev and M.S.Veger (farther), and my brother commanded the leading sailors' detachment. My brother persuaded me to go with him, as there was no veteran officer-communist. Not far from Petrograd our detachment found traces of the armoured train, which acted near Detskoe selo, and having heeled it, came up with it near Bologoe at the station Kunzhenkino, where we met with unexpected support from the garrison of Kunzhenkino. I took command over sailors' lines that came close to the armoured train. After short-term negotiations the armoured train gave in without a struggle, although most of officers escaped from it being disguised. Because of that incident we came to Moscow though with great haul, but already late, as the fighting was over and the power was fast in hands of the Moscow Council. For some time our detachment as the most reliable one was used by Muranov for mass searches with surrounding of the whole districts, but then it was given an assignment to go to south to counteract general Kaledin, who already then tried to hamper trains with provisions and coal, which were bounding for north. For that purpose the detachment was radically re-formed. There remained only the sailors' detachment as a core, a detachment of Petrograd Red Guards, a detachment of armoured cars, armoured troop-carriers of the Putilovskiy factory and armoured train of Kerensky. The regiment headed by the colonel Potapov returned with him to Petrograd, instead of it the Moscow ensign's school, which showed loyalty to the Moscow Council during the revolution, an artillery battery and several technical parties were joined to the detachment. As the colonel Potapov went away with his regiment, Eremeev and Veger also departed to Petrograd, even my brother was recalled for a work in the naval commissariat, then new elections of all the officers were held and thereby a sailor Khovrin, whom I knew by Helsingfors, was elected a detachment commander, and I was elected a chief of the detachment staff. Besides, soon a specially delegated representative of the Petrograd Military Revolutionary Committee ensign Pavlunovsky came to the detachment as a detachment commissar. Approximately on the tenth of November the detachment entrain a troop train and left Moscow. A first stop was in Tula, where the detachment was staying for two days and only by its presence helped the Council to take the power into its hands. The next stop, more sound, the detachment had to make near Belgorod. The fact point is that we had got information about moving of 9 shock regiments from the front to Novocherkassk, where all the counter-revolution was gathering at that time. It was said that general Kornilov himself was going to Novocherkassk with them. We at full speed went to Belgorod, that they had to pass by, and there we made an ambush for them with the intention not to let them go on at any price. Fighting with them were swaying from side to side during several days, a detachment of Black Sea sailors, arriving in time from south, gave effective help to us. That detachment was headed by a sailor Fiodorov, and a chief of its staff was some lieutenant, as a result all the shock regiments were totally defeated and dispersed, having left us many captives and defectors. I, being a chief of my detachment staff, not only worked in the staff, but participated directly in operations, commanding lines. Of course I didn't thought about my health at that time and certainly I underestimated my forces. As a consequence of stubborn work, many sleepless nights, nerve-strain and travellings afoot over long distances I fell off my feet. I had relapse of the paralysis of my left leg, however benignant, as I could move my leg, though with difficulty. A medical board in Belgorod prescribed me four-month rest, but having made certain that I wasn't fit for operations any more my, I hastened to Petrograd, where a governmental work of our party had begun by that time. Having again met my coworker at the newspaper work Podvoisky, who was then a commissar for military affairs, I accepted his offer to be a secretary of the People's commissariat of military affairs. IwasholdingthatpostfromDecember1917 tillMarch 1918. In March 1918, when the People's commissariat of military affairs evacuated to Moscow, I was loath to leave Petrograd and accepted an offer of K.S.Eremeev, who was then a commander-in-chief of Petrograd military district, and became a chief executive officer of the district headquarters. Parting from me Skliansky entrusted me in addition the duties of the commissar of the Main military court department, which I was fulfilling till its dissolution in July 1918. In the middle of 1918 the PC decreed to get me along with a number of other executive members to take part in party work and assigned me to "Krasnaya gazeta", having kept me on at my previous positions. I edited that newspaper at first together with Volodarsky and then, after his violent death, as a member of editorial board consisting of three people: Livorsky, Kharitonov and me. But the work for the newspaper and simultaneous jobholding in the military commissariat, where I was very busy, exhausted me and I prevailed upon the PC to release me from that work. At the end of 1918, when military specialists were got to take part in military work, I suggested abolishing the post of the chief executive officer of military commissariat affairs, in view of institution of the post of the chief of district headquarters, and instituting the post of the Director of Political affairs instead of it. My offer was accepted, and later on, according to that model all the district military commissariats of the Republic were established. I was the first, who was appointed Director of Political affairs. But I was holding that post not long. Podvoisky had been inviting me to Moscow for a long time, where he was a member of Revolutionary military council of the Republic and the chairman of the General military inspection. In December 1918 I came to Moscow, where I was appointed a chairman of inspection committee of the General military inspection. During almost the whole year 1919 I went about Russia, inspected and instructed military units and institutions. At the end 1919 the rights of the General military inspection were slightly curtailed, thus the work for it lost its interest considerably. On the other hand, operations at the fronts flared up with unprecedented sharpness, and a famous Moscow campaign of Denikin. All that made me to accept an offer of the commissar of the field headquarters Gusev and to transfer to work with him. In view of great advance of Denikin, for defence of avenues of approach to Moscow the so-called Moscow defense sector was formed, which consisted of the Moscow, Ryazan, Tula and Kaluga provinces. Gusev was appointed a commander-in-chief of that district, and thereby it was supposed that in case of the beginning of operations in the sector the Commander-In-Chief himself would to take command. A staff general V.L.Baranovsky was appointed a chief of staff of that sector, and I was appointed a commissar of staff. Theworkwaslivelyandinteresting. We were throwing out of the sector territory all that wasn't suited for battle and we were forming out battle-worthy units of all that could fight, whether those were special operations detachments, internal security units or Emergency Operations commission. Besides, there were carrying out some fortification works. In November 1919 Denikin, having not reached our sector and only in places crossed its border, was repulsed from Moscow, began retreating south, and the need for the Moscow sector disappeared. Not long before its full disbandment I accepted an offer of Podvoisky and transferred to work with him at the Chief Directorate of the Universal Military Training. In the Universal Military Training I held a number of positions one after another, sometimes two or three at one time, and in the end became a commissar of the Directorate. In October 1920 I had the second relapse of the paralysis of my left leg, that time it was more serious than in 1918. A neuropathologist professor Rakhmanov, who treated me and dragged me out of the hay relatively soon (in two months), strongly recommended me to change the medium and if possible – to go abroad. Having used a granted me month sick leave for trip to Riga, I got there an offer of my old friend Alexander to work as a consul of Russian Soviet Federative Socialist Republic in Libava, to which I readily entertained. The Central Committee agreed to that appointment, and on the 10th of February 1921 I already was in Libava with staff, selected by me. In Libava I was working till the 2nd of April 1922. There I had very interesting work first concerned with reception, "screening-out" and further sending to Russia of American emigrants, and then, in addition to general council work, I had a secret work on the instructions of some institutions. Having spent in Libava 14 months, I raised a question about my transferring to another work and in April 1922 was recalled to Moscow. There the Steering bureau of the Central Committee, taking into account my newspaper experience of 1917, kept me on at first at the Committee for managing and instructing of the provincia press, and then sent to Leningrad for practical work. In Leningrad I was editing "Vechernaya krasnaya gazeta" from May 1923, and then from August 1924 till August 1930 I was a deputy director of the Leningrad Regional commission on party history and a member of the editorial board of journals "Krasnaya letopis" and "Chess paper". In August 1930 I was appointed by the decree of the Central Committee an adviser to the plenipotentiary representation of the USSR to France. I was holding that position till January 1932. I retired from diplomatic service according to my resignation. In January 1932 I was appointed a deputy director of the Leningrad Institute of the history of the VCP and performed the duties of a member of the editorial board of journals "Krasnaya letopis". Central State Archives of historical and political documents of Saint-Petersburg. P. 18-25. Life and activity of of A.F.Ilin-Zhenevsky during the period 1932-1941. In January 1932 Alexander Fiodorovich Ilin-Zhenevsky returned to his native city and to work at the Leningrad Institute of the history of the VCP. At the Institute he worked as a deputy director with an academic status of a first-class worker. At that time literary and publicistic activity of Ilin-Zhenevsky revived. In 1931 his book "Memoirs of «Vitmerer»" appeared in print, his book "From «the February» to seizure of power. Reminiscences about the year 1917" came out in English and German. From August 1933 he again returned to diplomatic service, the adviser to the plenipotentiary representation of the USSR in Czechoslovakia. He mainly dealt with problems of cultural and sports collaboration between the USSR and Czechoslovakia. Alexander Fiodorovich acted as one of organizers of an important then match between the champion of Czechoslovakia, one of the strongest grand masters S.Flor and the champion of the USSR M.Botvinnik in 1933. 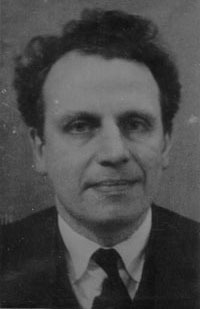 A.F.Ilin-Zhenevskyworked in Czechoslovakia till the summer of 1935, and then he was designated as the deputy of diplomatic agent at the Diplomatic Agency of the People's Commissariat of Foreign Affairs in Leningrad. In July 1938 because of the abolishment of the Diplomatic Agency he was dismissed from the People's Commissariat of Foreign Affairs. Later on he transferred to the work at the Leningrad Agency for protection of state secrets in the press, where he worked as an inspector of the library section, a commissioner of the department of foreign censorship, a chief of the section of fiction and arts. In 1939 – 1941 worked as a commissioner of the library section, at the same time his position was called in orders a commissioner political editor. At the work for the Leningrad Publishing House he filled less significant positions in his professional activity; in our opinion it's connected with announcing of F.F.Raskolnikov an outlaw under the sentence of the 17th of 1939 of the Supreme Court of the USSR. An outstanding chess player, revolutionist and historian Alexander Fiodorovich Ilin-Zhenevsky was mortally wounded on the 3rd of September 1941 during the bombing of Soviet boats at the pier near the town Novaya Ladoga. He and his wife Taisia Alexandrovna were buried together at the common memorial cemetery in Novaya Ladoga, where in 1978 an obelisk was erected at their grave. In 1986 in the town Novaya Ladoga a chess club was founded, which in 1991 got the name "Ladoga". Since 1988 the club has been held annual tournaments in memory of A.F.Ilin-Zhenevsky. On the 20-21 of November a commemorative tournament, devoted to the 110s anniversary of the birth of the outstanding master of chess, in which chess players of Saint-Petersburg and Leningradskaya region took part. FOR CHESS AS AN ART! What is chess — art, sport or another thing? This vexed question arises again. Don't think this question is an abstract and philosophical one. No, this is a topical question of the day, closely connected with practice and today's orientation of the chess work. From one or another solution of this question it depends one or another solution of a number of practical questions at issue. Let's consider today's situation. Chess movement in the USSR is one of the constituent parts of physical culture movement. Chess circles at the local level and in the centre are the circles of the Councils of physical culture. Consequently now chess is considered to be a kind of sport. The question is as if solved, but this is far from true. Why did chess movement turn out to be a part of physical culture movement? That happened not accidentally. We did it knowingly, from purely practical considerations. We considered that forms of physical culture movement and physical culture organizations were the most appropriate for construction of a chess organization. That's so, here and there we have now a harmonious organization, beginning with local circles at an enterprise and ending with highest leading centers; here and there we have team meetings, mass competitions and championships, culminating with such a great competition as a championship of the USSR. The similarity is as though full, but this similarity is only superficial one. If chess players by virtue of objective, historical circumstances turn out to be physical culturist, then does it mean that we consider chess to be a sport — and that is all? No, it doesn't. Does it mean that principles and methods of work in physical culture organizations can be unconditionally extended to chess organizations? No, it doesn't. A great principal distinction between chess and physical culture is that physical culture is only means — means of forming a healthy man, while chess is not only means, but also purpose, that is besides its useful educational value, it has its inherent great value as an art that hasvoluminous literature and great culture, accumulated over the centuries. Nevertheless physical culture organizations, which took in chess organization, pretend to an ideological leadership in it, that causes a number of misunderstandings and at times directly damages the development of chess as an art. Let's consider, for example, a notorious question of "champion's title". In physical culture that, as I've already told, doesn't have an independent value, this phenomenon is struggled against and it's absolutely right. In physical culture "champion" is a man that is occupied only in his own self-perfection and alienated from masses and mass work. Benefit from such a man is certainly comes to naught. What's the use of that one or another physical culturist would bring himself to such a degree of perfection that would jump higher than St.Isaac's Cathedral. It would be of no earthly use to anybody. The struggle with record-holding in physical culture is quite right and sound trend. Chess is quite another matter. Here, as in any other field of art or science, there problem must be stated quite oppositely. Newton, Beethoven and Morfy were "record-holders" in their fields, and nobody accuses them of that. The same way now a "chess champion", a "record-holder" — is a man, who establishes high standards of chess creative work, enriches thesaurus of human culture, and his games or compositions will be studied now and in a thousand years with the same interest and love. That's why chess organizations must contribute to intensification of chess art, encourage individual chess players in their work at self-improvement, assist in organization of meetings betweeneminently qualified chess players, certainly with the purpose that it would be without detriment to mass development of chess art and that chess players wouldn't be alienated from mass and public work. Or another question — about participation of representatives in non-proletarian international competitions. From the point of view of physical culture such participation is complete nonsense. And that is quite clear. What do our sportsmen can take over from west-european non-proletarian sportsmen? Almost nothing. While association with them causes a certain political damage to us. We can with total composure give up all the sport west-european achievements and start to build up our proletarian sport anew. The situation in the field of art and science is quite the different. Here we have a great culture, accumulated over the centuries that we certainly can't be ignored by any means. Here our achievements can be based only on the works and discoveries of many generations that lived before us. That's why our scientists take part in non-proletarian international scientific congresses, our artists take part in non-proletarian international competitions and contests (contest in memory of Chopin in Warsaw), there is even a society of cultural contacts with foreign countries that contributes to cultural rapprochement of scientific and artistic forces of the USSR and the West. All that must be extended equally to chess. Must, but — alas! — in practice we see quite another. IV All-Union chess-checkers congress, according to the report of N.V. Krylenko, carried an excellent resolution, in which it's said by the way: " ...The congress considers to be obligatory for leading chess organizations of the USSR using also in that field achievements of bourgeois culture, for what it considers quite possible and allowable: ...b) sending and participation of some masters of proletarian organizations in bourgeois competitions, setting thereby as an object not the struggle for the championship or another place in a tournament or objects of competitive spirit, but having in view training and raising playing class of our masters for the subsequent transmission of received knowledge to instructors of chess proletarian organizations; c) organization of international tournaments at expense of proletarian chess organizations with participation of bourgeois chess players, but on condition that the organization of those tournaments, selection of invited masters, conditions of a tournament etc. would be determined only by proletarian organizations independently of any instructions of bourgeois organizations or negotiations with them". This resolution was never put to practice. We don't organize international tournaments, don't send our masters to west-european competitions (with the exception of an unsuccessful attempt to send Verlinsky to Italy). What is the matter? May be the problem is in means? No. There is no need in ample money to send our master to international tournament. Besides, it's possible to come to an agreement with an organizing committee of a tournament about repaying a participant for his traveling costs and maintenance costs, what is done frequently. There is another problem. It is no secret that leading physical culture organizations, treating chess as one of the kinds of sport, consider this resolution to be erroneous and without scruple speak of thereby existing chess movement "Krylenko's deviation". Physical culture organizations don't understand chess importance. They dilute its content and are satisfied with only its form. In this respect they must meet with a resolute rebuff on our part. For us chess is first of all an art, and the fact that it may be used as sport is quite different matter. It's time to join chess to Soviet arts and put on it those political rights and duties, which are put on all of the Soviet arts. Blind adjusting to the forms of physical culture work distorts our ideological line and directly damages the chess as an art. It's possible to sacrifice the form for the sake of content. However convenient for us building of our organizations according to the line of councils of physical culture is, but if it imposes obligations on us that directly damages the chess as an art, then an involuntary question arises of whether we to change our structure? Recently somebody suggested an idea that it would be more appropriate for chess as an art to be built according the line of the Main office of art affairs. The former president of the Main office of art affairs F.F.Raskolnikov welcomed the idea. That is the question to reflect on. "Chess paper" № 4, 1930.